Kuba was a weaving powerhouse. This role has been out in the open for some time;  the following paragraphs go into greater detail concerning an Iranian language group termed Tats by Turks. 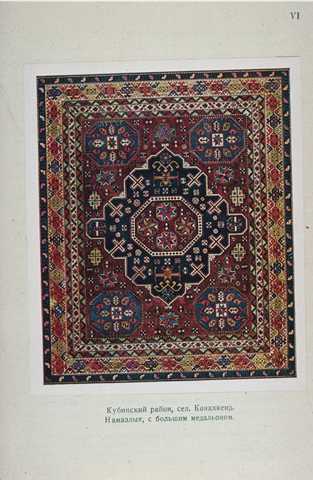 By the turn of the 20th century the government’s kustar’ support program had reacted to widespread design deterioration and had completed an oblast’-wide (Caucasia) survey in an effort to establish authentic motifs and patterns. 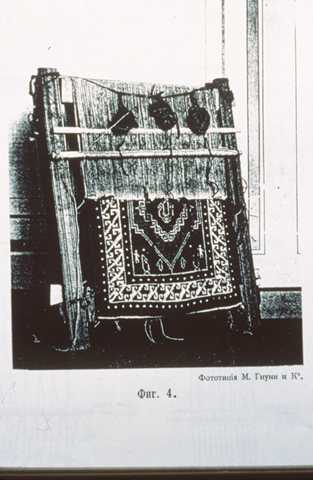 An active support program was underway – yarns, dyes, equipment (Kuba loom, below), marketing assistance – this last extending to international expositions (Paris, 1900, Caucasus section entrance, below). Some villages perhaps did own the copyright, so to speak, for a particular pattern; however, since other locales copied, a good view would be to consider that place and pattern nomenclature c. 1900 are as accurate as they can be but that production sites vary, as, for example, the “Shirvan-Chichi” type. A hard and fast rule can’t be laid down as to Kuba structure because of the likelihood of exceptions but a somewhat depressed warp can be taken as a marker. Such was the opinion of the late Najiba Abdullaeva and she knew her stuff. 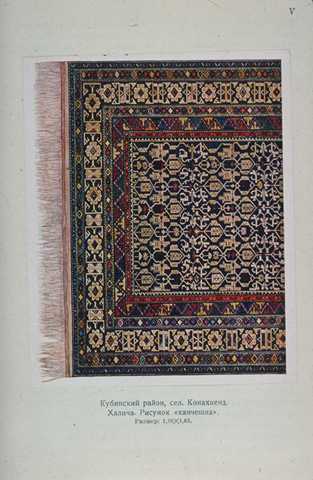 There is a detailed written description of the Kuba weaving technique which can be read to substantiate this view, but words are ineffable in this context and no conclusion is possible. End finishes could be either braided warps or a short flatwoven strip, color irrelevant. A 1901 interview-based review of the principal weaving villages recited the problems typical for the period: poor prices and weaver wages, incursion of synthetic dyes, some increep of cotton warps. The most notable finding, however, was that vegetable dyes were still dominant, still the case in 1912 per another kustar’ program source. 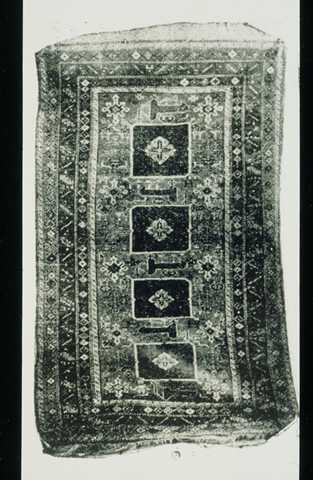 Also of central interest, pile rugs were not of consequence until well into the 19th century. The survey of these 27 villages identified some start times as: 50 years previously – 2 villages (including Chi-Chi); 30 years – 2; 20-25 yrs. – 5 (including Zeikur, Imam-Kuli-Kend); and 10 yrs. -- 7. Prior to this the flatwoven technique prevailed --- kilims, sumacs, and bags. The focus of the survey was economic, how to better the income of the weavers. By the mid-19th c., a generation after the Russian conquest, the needs of villagers for cash had increased as items previously not in good supply – kerosene, sugar, salt, and the like – had become virtual necessities. Carpet-making shifted from meeting home household needs plus casual local commerce to a market-oriented economic enterprise – described at some length in the schoolmasters’1888 survey  -- with thousands of weavers, many of whom needed to purchase wool; in some situations it was necessary to hire additional help. In 1901 certain villages were in the grip of a decline (poor prices, poor workmanship); others were on the upswing. 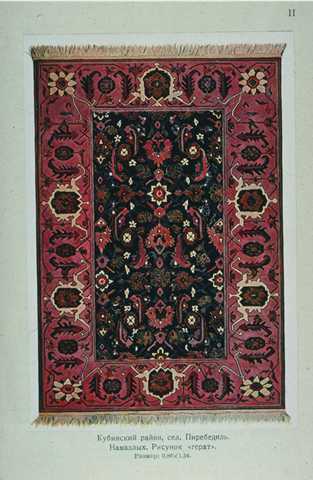 The atmosphere at the time was revival and expansion of production; one element of this was the “taking of them [designs] from Persian rugs.”  The evident response to a growing market plus a prior history of predominantly flatwoven items indeed suggests that Persian patterns were a new development. Assimilation into Azeri culture has been going on for a long time and continues. The life style has always been sedentary. Population counts of the group have diminished considerably over time. Of note is their Kuba presence as well as that on the Apsheron peninsula (in buff), per the map above. 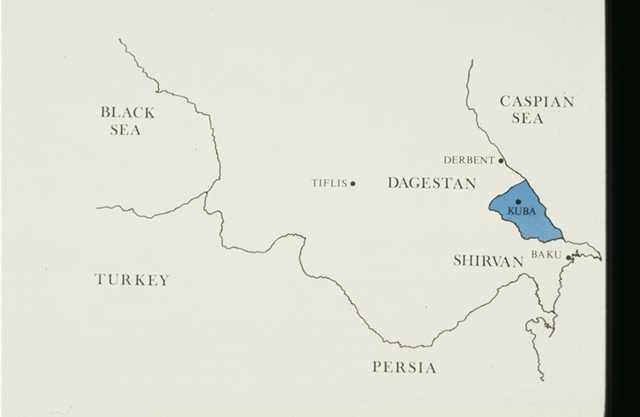 The 1897 census gave the population of Kuba district as Tat, 46,430 (24%); Azeris, 70,150 (38%). 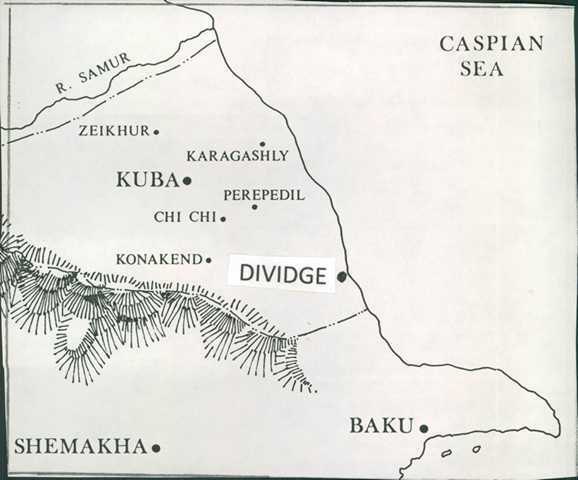 Ethnographic work in the 1950’s identified Tat village locations as: in Kizin area, 27; in Siazan, 4; in Divichi, 16; in Konakend, 18; and, in Kuba town and vicinity, 15. Mid-20th c. population numbers are perhaps a little squishy, in the range of 20—30 thousand. 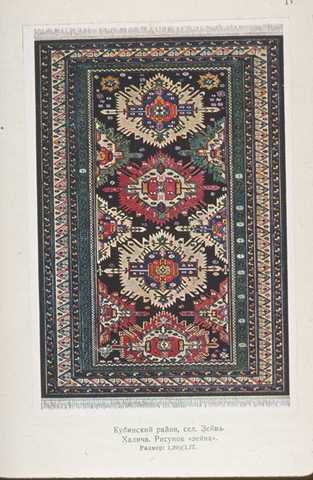 A review of the 1924 carpet exhibition held in the ethnographic section of the Russian Museum contains a strong tilt toward Tats: designation of the principal Caucasia weaving centers as Karabakh (Azerbaijanis) and Kuba (Tats). 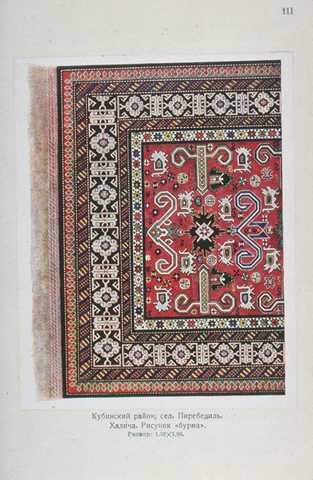 The author makes an interesting observation concerning color “…exclusively in Tat rugs it is almost never [that] a red coloration (in the aggregate of its hue) can be seen as dominant.”  This characteristic could possibly reflect an esthetic preference since madder was still relatively abundant, left over from its commercial boom in the mid-19th c.
Rugs illustrated below are for patterns of Tat villages and are from plates in Isaev which are reproductions of Zakostorg lithographs (1928) of items available for export via orders placed in its Leipzig office. 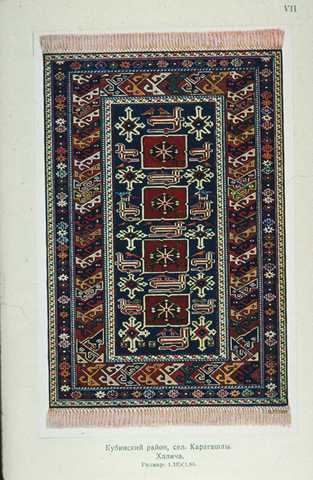 In descending left/right order they are: Perebedil’, burma pattern, and Perebedil’, Herat pattern; Zeiva, zeiva pattern, and Chi-chi, - khrda pattern; Konakend, namazlik, and Konaked, khanchesa pattern. 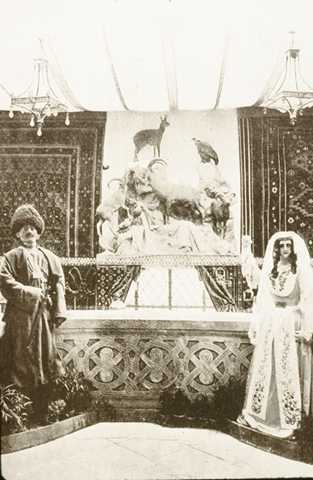 Istoria Azerbaidzhana, Vol I, pp. 340—341, p. 365. 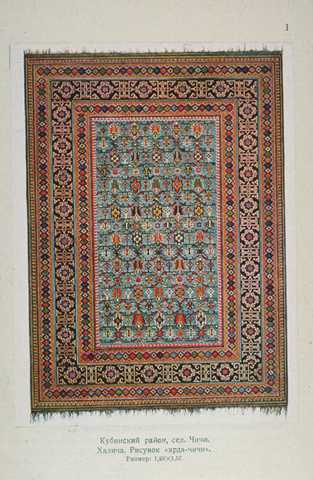 See Caucasian Carpets and Covers, Wright, Richard E. and Wertime, John T., 1995, p. 62 ff. Erroneously called pile in Caucasian Carpets and Covers. Kara-Murza, I. M., Kustarnaya promyshlennosti’ na Kavkaze, vypusk’ 1, kovrovyi promycel’ v Kubinskom’ uezde, 1902. Second All-Russian Empire Kustar’ Exhibition, 1913. Kara-Murza, op. cit., p. 29. Pyshenko, Vladimir, Kuba uezd, promyslovyya zanyatia v nekotoryk nascellenykh punktakh Zakavkaz’ya, in Sbornik materialov dlya opisanya i mestnostei i plemen Kavkaza, Vol. XI, 1891, pp. 151—154. Kara Murza, op. cit., p. 29. Zummer, V. M., Sovremennye kubinskie kovry, izvestiya o-va obskedovaniyai izucheniya Azerbaidzhana, No. 3, 1926, pp. 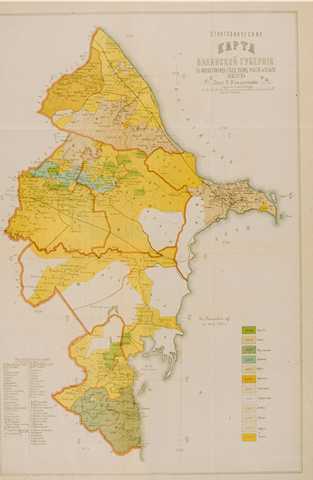 185—193. Miller, Vsev., Materialy dlya izucheniya Ebreisko-Tatskago yazyka, Imperial Academy of Science, 1892; Recherches sur les dialects Persans, Casan, 1851, p.69. Mamedov, Aliaga, Aspects of the Contempary Ethnic Situation in Azerbaijan, “The Tats”, The Red Book of the Peoples of the Russian Empire, www.eki.ee/books/redbook/tats.shtml. Frye, R. N., “Historical Evidence of the Movement of People in Iran”, The Muslim East: Studies in Honor of Julius Germanus, 1974, pp. 221-223; See also Donald L. Stilo, “The Tati Language Group in the Sociolinguistic Context of NW Iran and Transcaucasia”, Iranian Studies. Zapiski Kavkazskago otdela…, Etnograficheskkye karty’, Supplement Vol. 18, 1896. Pervaya vceobsh perepic’ naceleniya Rossiiskoi Imperii, Bakinskaya gubernia, Vol. 61, 1897. Grunberg, A. L., Yazyk Severoazerbaidzhanskikh Tatov, 1963. Miller, A., Kovrovye izdeliya vostoka, 1924, p.5, p.9, p. 14, p. 22. Zummer, op. cit., p. 190. Isaev, M. D., Kovrovoe proizvodstvo Zakavkaz’ya, 1932.